As a busy, working mom of 3 children, I'm constantly looking for quick and easy meals that are also healthy. 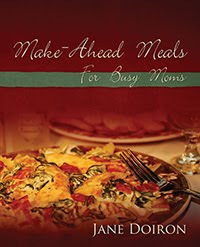 When Jane Doiron, author of Make-Ahead Meals for Busy Moms contacted me for a review, I was intrigued to see what sort of Make-Ahead Meals would be in this book! This book contains Helpful tips, as well as tons of recipes! From Appetizers to Soups, you'll be sure to find some recipes that will suit you and your family's palate! In a gallon-size storage bag, combine the mustard and honey. Rinse and dry the chicken tenders and place them in the bag. Seal the bag well and turn the bag several times to coat the chicken. Refrigerate until you are ready to cook. Place the measured bread crumbs in a shallow container, cover it, and leave it on the counter. Preheat the oven to 425 degrees Fahrenheit. Spray a 15X10X1" sheet pan with nonstick cooking spray. Coat each chicken tender with the bread crumbs and place on the baking sheet. Spray the tops of the chicken with nonstick spray. Bake for 20-25 minutes until browned and cooked through. Serves 4. We are BIG chicken eaters in my house and I've spoiled my kids so much with boneless chicken that they don't want bone-in chicken, so we always have some boneless chicken breasts in the freezer. I use them for all kinds of recipes, and I make my own chicken tenders. This recipe was a scrumptious recipe, with tons of flavor. I just loved the honey and the mustard together! The kids didn't even use any dipping sauce, like they always do, but I mixed some spicy brown mustard and some honey together just in case. There are quite a few other recipes in this book that I plan on trying, because with football and work, we're always on the go and sometimes we eat more fast food than I like to. Having this book around will definitely change that! Next I want to try the Chicken Cannelloni - it looks so good! One of you will win a copy of this book all for yourself! To enter, go to Jane Doiron's website, Make-Ahead Meals for Moms, and sign up for the newsletter, then come back here and tell me that you did so. This giveaway is open to residents all over the world, and will end on October 22nd at midnight EST. Winners will be announced in a post here at A Simple Kinda Life and will be emailed. Winners will have 48 hours to claim their prize or a new winner will be chosen. I signed up for Makeahead meals for mom's newsletter. I have the MAM button at http://getalonghome.com. I have your button at http://getalonghome.com. Also, my MomFaves username is Spoodles. Forgot to put that on the last comment. I'm an Orglamix FB fan: Cindy Greer Dyer. I entered the YoBaby giveaway. I followed your blog on Facebook, became a fan on Facebook and added you to my blog roll. Signed up for Make-Ahead Meals for Moms Newsletter. I follow you on Twitter (anatolyevna). I follow Make-Ahead Meals For Busy Moms on Blogger. I entered the $25 Gift Card to Macy's giveaway. I signed up for the Make-Ahead Meals for Moms newsletter. I signed up for the Make Ahead Meals newsletter! I follow your blog via networked blogs! I entered the My Little Pony giveaway! Thanks for sharing this book and recipe!